John â€œDutchâ€ Summers, center, was presented with the 2018 Herbert W. Vanden Brul Entrepreneurial Award, presented by RITâ€™s Saunders College of Business. Pictured, from left to right, are Bill Vanden Brul; Sandy Parker, Summersâ€™ wife; Summers; Saunders College Dean Jacqueline Mozrall; RIT President David Munson; and Pattie Vanden Brul Nunnari. John “Dutch” Summers, CEO of Graywood Companies, Jasco Heat Treating and Jasco Pharmaceuticals LLC, has been named the 2018 recipient of the Herbert W. Vanden Brul Entrepreneurial Award, presented by Saunders College of Business at Rochester Institute of Technology. The award, which is given to entrepreneurial leaders within the upstate New York region, was presented at Oak Hill Country Club on June 6. Summers manages Graywood Companies, a Rochester-based holding company managing residential and commercial real estate. For decades, he also served as CEO of Jasco Tools Inc., a global provider of standard and specialty cutting tools, custom components and heat treatment services. He was the third employee at Jasco Tools, which was founded by his father in 1951. Summers began running the company in his 20s and grew Jasco Tools into a holding company overseeing four businesses, one of which became the largest tool-and-die manufacturer in Rochester. In 2014, Jasco Tools was acquired by Michigan-based Arch Global Precision LLC. Among other distinguished guests, Summers was joined by Herbert Vanden Brul’s children, Pattie Vanden Brul Nunnari and Bill Vanden Brul. During the event, Summers expressed his appreciation in receiving the honor and talked about his drive for being an entrepreneur. Summers also offered words of wisdom to several students in attendance representing RIT’s Saunders Summer Startup program, an initiative hosted by Saunders College of Business and Simone Center for Innovation and Entrepreneurship aimed at assisting entrepreneurs and innovators in developing their business concepts to a point where they are ready to begin to seek angel investment. “Enjoy the journey of life, adjust to pitfalls and obstacles, strive to make others better, nurture talented people, find a wonderful teammate to share life with and get a good night’s sleep,” added Summers. Summers is a long-standing figure in the Rochester community. He is the former co-owner of the Strathallan Hotel in Rochester’s East End district and is co-founder of the Rump Group, a nonprofit business collective that was absorbed into the Rochester Business Alliance, now part of the Greater Rochester Chamber of Commerce. He is also the founder and president of the John and Jayne Summers Foundation, which he created with his late wife, Jayne, to support educational, health and human services organizations. He serves on the board of directors of the Greater Rochester Chamber of Commerce and was inducted into the Rochester Business Hall of Fame in 2010. He was appointed to RIT’s Board of Trustees in 1996 and became a trustee emeritus in 2010. He has been involved in numerous RIT boards and committees, including the Kate Gleason College of Engineering Strategic Planning Advisory Board and the Center for Integrated Manufacturing Studies’ Advisory Board. He has generously supported RIT, with a special focus on scholarship funding for hundreds of students. 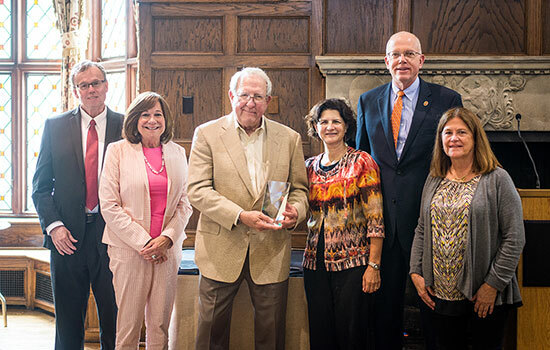 In 2016, Summers and his wife, Sandy Parker, who is also a member of RIT's Board of Trustees, received RIT’s Nathaniel Rochester Society Award, presented annually to an individual or individuals determined to have contributed to the overall advancement of the university at the highest level. Huzehui Xia, a visual communication and design graduate student from China, is currently developing her business through the Summer Startup Program. Her company has created an app called Sniffy that aims to improve the relationship between pets and their owners. “Today, I am happy to network with the high-level executives who are here, find about the skills that they’ve developed through the years and learn about their experiences as business owners,” said Xia. In his remarks, RIT President David Munson referenced RIT’s role in the community as well as Rochester’s strong economic climate. The Herbert W. Vanden Brul Entrepreneurial Award was created in 1984 and annually given to a successful individual who developed a business that improved the Rochester economy or whose innovative management skills have changed the course of an existing business. Past Vanden Brul recipients include Joseph Lobozzo, former CEO of JML Optical; John Smith, IT serial entrepreneur; Ronald Ricotta and Michael Nuccitelli, co-owners of Century Mold Inc. and Parlec Inc.; Robert Morgan, CEO, Morgan Management LLC; the late Ernest J. Del Monte Sr., E. J. Del Monte Corp.; Douglas Brush and Jim Brush, Sentry Group; William K. Pollock, Optimation Technology; Kitty Van Bortel, Van Bortel Group; and E. Philip Saunders, Griffith Energy. For more information about the Vanden Brul award, go to https://saunders.rit.edu/vanden-brul-awards.